At Mendip Conservatories we have listed the most common conservatories and glazed extensions FAQs with our advice. We come across many consumers who have been ill advised and who literally pay the price when they come to try and sell their property. Do I need Building regulations approval for my conservatory or glazed extension? 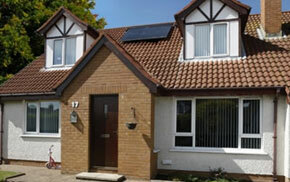 Building regulations approval is required for all “extensions” to a property. 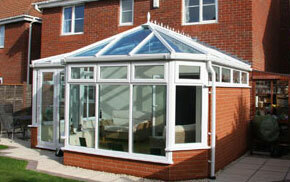 However, in some instances the extension or conservatory may be exempt from this requirement. The conditions required to be exempt are generally that there is an external quality barrier between the house and the extension, that the extension has independent (to the main house) or no heating, that any electrics installed are certificated by a qualified electrician, and that the glazed extension is mostly glazed. The benefit of not pursuing the building regulation approval option is the savings that can be made in both fees to the local authority, energy performance testing on the house (SAP calculations), and the relative cost of building works in terms of the additional specification required to meet LABC approval. The increasing popularity of tiled roof conservatories and replacements has led confusion among consumers and companies alike. Indeed there are differing opinions among LA’s too. Many solid roofs on the market come “LABC approved” this however does NOT negate the requirement to obtain building regulations approval for the whole structure and its build composition. Find out more here. Can I have a drain or manhole cover in my conservatory or glazed extension? The conservatory market is changing. Long gone are the days of the “3 by 3 Victorian with a polycarbonate roof”. Popular television programmes such as “Grand Designs” have changed the demand for extensions and conservatories. Many conservatory companies now offer a range of solid roof solutions, while many traditional builders contract out the glazing for the extension to specialist window and door companies due to the relative complexities of bi-folding doors and specialist glazing. In truth there is now very little difference between the two. Price wise, as with everything, you get what you pay for. A good, reputable conservatory company may offer a complete package for an extension with the backing of service and warranties, and a fixed price, not always so forthcoming with a jobbing builder. In either case nowadays, relative to the value of the property, conservatories, glazed extensions and traditional extensions are all lower in price than they used to be, and add more value to the property than previously too. The common name for a multi-fold door, a bi-folding door is a set of doors with more than one leaf which are hinged in a combination that potentially enables a whole aperture to be open when the doors are open. This is an ideal option for clients wishing to maximize an opening, unlike a sliding patio door where one leaf slides behind another, or a pair of French doors with side-screens, a whole space may be opened up. Available in PVCu, aluminium or hardwood, these style of doors, while often more expensive than their alternatives have become very popular in the home improvement and particularly the glazed extension and new build market. Find out about our range here. How much do bi-folds cost? 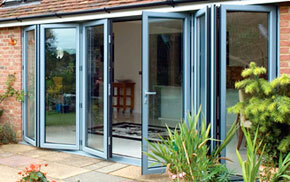 Bi-folds, bi-folding doors or multi-fold doors vary in price dependent largely on the material, eg. Aluminium, PVCu or hardwood, and the colour. most door sets have a range of furniture (handles, hinges etc) and threshold options which can also affect the price. 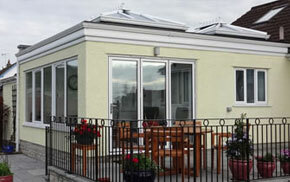 See our price guide here for a price guide on the “Warmcore” aluminium product. Can I open up the back of my house into an extension or conservatory? Yes! it is possible to remove the existing doors and / or window to “open up” your extension, orangery, conservatory or glazed extension. The pre-requisite is that in doing this, any addition then requires building regulation (building regs) approval, without which, selling your property may cause some headaches. Greater costs are incurred if you are widening an aperture, due to the need for a lintel, which requires structural calculations, plus the lintel costs which can be expensive, dependent on the load bearings of your property. Removing an existing window or door only, can create a “though space” although consumers should then bear in mind, the building regulations requirements referred to above. Buying a conservatory is not as straight forward as buying a car. There are so many variables affecting the price before one even considers “upgrades” in the same way that one might when choosing a new car. These variables extend from choice of materials and their colour to regulatory costs. Many companies are reluctant to give “ball park” figures due to the potentially huge variables which exist. A hardwood option, as above, approx. £2,500-£3,000 per square metre. There will be significant fluctuations in prices between companies, depending on what they are able to offer, but the above is a reliable benchmark for a completed project including building work, electrics, installation, heating options, and flooring. At Mendip Conservatories we do not shy away from the true cost: there are no hidden surprises. We find in a market where consumers generally obtain 2-3 quotes, we are mid-range and due to our “we work harder” ethic, offer the best value for money for a complete service in our region.